This is straight-up the best comic in the industry right now. It began over ten years ago with an idea very similar to the recent TV Shows “Grimm” and “Once Upon A Time”: what if you re-imagined characters from classic fairy tales in a modern-day context. 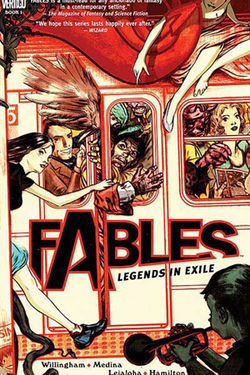 In the case of Fables, these characters became refugees living in New York under the noses of their human “mundy” neighbors after a malevolent being known only as the Adversary has conquered their fairy tale homelands. Part of the problem with the two shows mentioned before is that they can only imagine these characters in a single context–in a police procedural or a small-town drama. The beauty of Fables is that it has never been shy about trying to find contexts in which the concept can’t work. 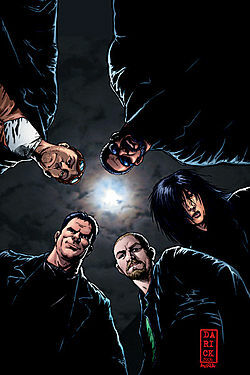 The first story arc, “Legends In Exile” will likely appeal to “Grimm” fans given its police procedural elements, but will likely surprise those same fans when they read the next arc: “Animal Farm”, a political thriller about a revolution among the animal fairy tale folk against the human-looking ones. Since then Fables has worked as a taunt thriller, war epic, spy narrative, and in what I think is the greatest single issue published of any comic book in the last ten years both an allegory for the state of Israel and the most satisfying wedding story I’ve ever seen in issue #50. I made the mistake several years ago of buying the series month-to-month rather than waiting every 6 months to read it in collected editions and now I am addicted. I cannot go a month without reading this book. Seriously. Do yourself a favor and read this book. It is that good. A lot of my readers will know the title from the AMC series of the same name, which I hesitate to call a direct adaptation of the comic for a number of reasons. 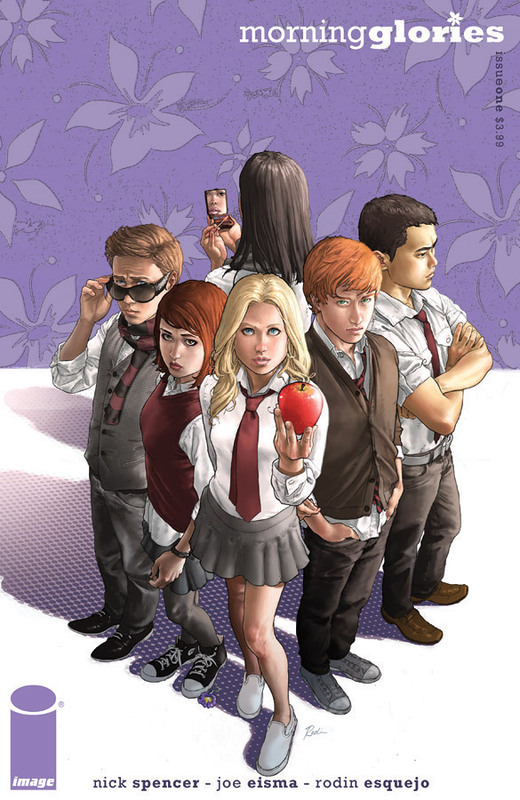 True, the seasons thus far have roughly lined up with the narrative arcs found in the first and second volumes of the series, but the TV show has made vastly different choices with many of the characters. In some cases creating moments of incredible emotion and at others just leaving those of us familiar with the comics scratching our heads (BTW, all the really annoying stuff with Lori and Carl from the TV show is not in the comic…just FYI ;). The comic, however, is where it all began. Robert Kirkman had a really interesting idea: what if one were to tell a story about the zombie apocalypse but don’t have an ending in sight? What if instead of getting from point A to point B, the idea of the series was to see in long-scale form what kind of choices people would make when it came time to face a lifetime with the walking dead? 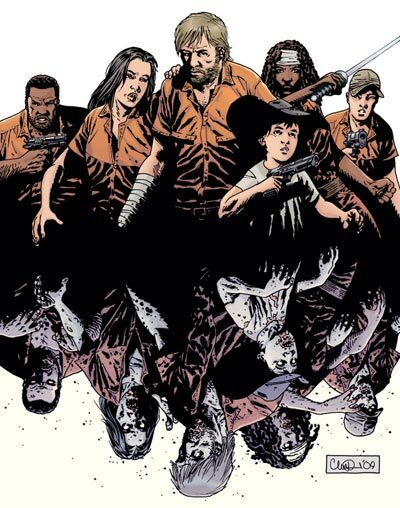 It sounds like a simple premise, but Kirkman has a talent for giving us characters so fascinating we cannot look away. I cheered in the season finale of Walking Dead to see they’d finally introduced Michonne, a young woman who I think it is safe to say is one of the greatest characters the comics have yet introduced us to. Also watch out for The Governor. I’m very, very curious to see how they play him in the show and whether they blink first with regard to some of the elements of the character that might wind up onscreen. Suffice it to say, he is the most intense embodiment of evil I have ever seen in any form of literature or fiction. This series is constantly engaging, constantly surprising, and really, truly makes you care about the characters in it. Every character is an individual that has good days and bad days and every time one of them dies, you feel the loss like an old friend. Marvel launched its Ultimate lineup of comic books over ten years ago to solve a long-standing problem: they had more than 40 years of continuity and fans who’d stuck with the books the whole time and yet that continuity had made the books nearly impossible for new readers to decipher. At a few points in Marvel’s history, they’ve attempted projects that start familiar characters over from scratch and avoid such continuity issues, but these projects have never lasted for very long and the results have been mixed at best. The Ultimate line was different, however, rather than just retelling older stories without 40 years of backstory to work with, a number of creators were given free reign to re-imagine the characters from the ground up. Captain America became a border-line racist with a distinctly 1940s sensibility, Thor became a New-Age spiritual healer, and Spider-Man was still Peter Parker…but then the writer took the biggest chance of all: he killed Peter Parker. Last year, Peter’s rogues gallery in this universe finally got the best of him. One of the strengths of this book had always been that the writer wasn’t afraid to imagine that a 16-year-old boy essentially working as a cop or a soldier would be vastly out of his depth. Peter having nervous breakdowns and coming very close to being seriously injured were commonplace throughout the title’s run. So much so that the other characters in the universe would frequently intercede either to try and convince him to stop before he got killed or at the very least learn how to do the job from the professionals. In the end, he dies protecting his Aunt May and Mary Jane Watson, having made an error in the thick of battle that leads to him taking a bullet intended for another target, then slowly bleeding to death when he cannot disengage from combat long enough to receive proper medical attention. After all this, writer Brian Michael Bendis then took the unprecedented step of having a new young man take up the identity of Spider-Man. It’s been controversial, but ultimately I think it’s one of the greatest decision Marvel has made with this like of comic books. 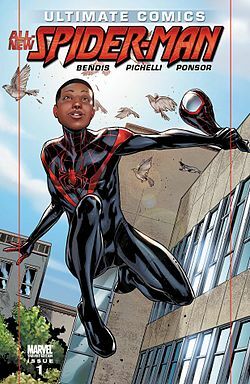 Miles Morales is a half African-American, half Hispanic young man from Brooklyn who has just lucked into a spot in a charter school soon after he acquires powers similar to Peter Parker’s. Miles knows even less about being a hero than Peter did, and the first few issues where he grapples with wanting to do good but frequently makes mistakes are wonderfully nuanced. Any of us who’ve ever worked in public service and have questioned our choices after seeing their mixed results will identify with him instantly. Beyond the fact that one of Marvel’s flagship heros has finally reached outside the familiar WASP backgrounds that have long been a black mark on comics’ attempts at diversity, the book works as an excellent metaphor for showing the intense pressure young people trying to make a better life than their parents had are under. Miles’ attempts to break free of his low-income background are haunting and timely. Come spend a day in this child’s world and find a wonderful backdoor into relating people you may never know otherwise.